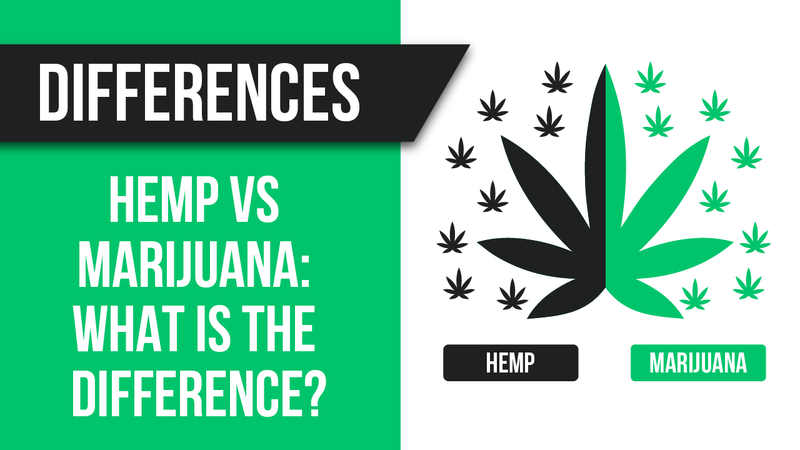 Hemp vs marijuana: what is the difference? Hemp and marijuana are common names for two distinct varieties within the Cannabis genus of plants. However, these terms have often been used interchangeably which has caused a lot of confusion and difficulty in understanding the use cases and benefits of hemp and marijuana, respectively. One noteworthy side effect of this confusion has been the unnecessary stigmatization of hemp due to its association with marijuana. As you may already be aware, marijuana is known to induce the notorious “high” which recreational users seek to experience. On the other hand, many people do not realize that hemp is entirely non-psychoactive while it also provides numerous potential health benefits similar to medical marijuana. This brings us to the main topic of this article – what is really the distinction between hemp and marijuana? If you are curious to find out, keep reading in order to gain a much better understanding of cannabis in general and its different varieties. This article will introduce the Cannabis genus of plants and shed light on the differences between industrial hemp and marijuana. Cannabis has long been cultivated and used widely for hemp fiber, hemp seeds and oils, hemp leaves for vegetables and juice, various medicinal purposes, and as a euphoric recreational drug. Generally speaking, the Cannabis genus of plants belongs to the Cannabaceae family and consists of three different species, namely indica, sativa and ruderalis. Cannabis indica was initially discovered in India and is characterized by a short and bushy physical appearance. Some scientists still doubt the existence of Cannabis indica as a species distinct from Cannabis sativa. Cannabis sativa is the most common Cannabis species that has been cultivated throughout history and utilized for a number of purposes, including the production of food, clothes, rope, medicine, and recreational use. This species appears taller and skinnier in its anatomy while consisting of less dense leaves than indica. Furthermore, sativa tends to grow most of its branches and leaves in the top part of the plant. Finally, Cannabis ruderalis is a rare species which is able to withstand harsher conditions than Cannabis sativa and Cannabis indica. It is native to Russia and the hardest of the three but naturally remains relatively poor in terms of richness with cannabinoids. In particular, Cannabis ruderalis has the lowest cannabinoid content when compared to indica and sativa. Nonetheless, it is important to note that humans have been involved in multi-purpose cultivation of Cannabis sativa for millenniums, whereby the effects of artificial selection have led to the creation of several different types of Cannabis within the same species. A relevant guide published in the Cannabis and Cannabinoid Research journal confirms that the existence of separate indica and sativa species is still debatable to this day (https://www.ncbi.nlm.nih.gov/pubmed/28861494). Nonetheless, this work also proposes that the Cannabis varieties, such as hemp and marijuana, as named by medical patients and recreational users, should be referred to as strains since these names have no taxonomical validity. Thus, hemp and marijuana will be referred to as Cannabis strains for the remainder of this educational piece in order to avoid any potential confusion with botanical families (Cannabaceae), genus (Cannabis) and species (indica, sativa and ruderalis). Hemp and marijuana are definitely not the same, even though they are closely related to Cannabis strains. Industrial hemp products are generally made from cannabis plants that are capable of producing a lot of fiber, while marijuana is generally utilized for medicinal and recreational purposes. So, what really defines whether a Cannabis strain is called “hemp” or “marijuana”? Hemp simply refers to Cannabis strains cultivated for non-drug use and containing a low psychoactive tetrahydrocannabinol (THC) content. On the other hand, marijuana refers to strains with high THC content! However, is that the only distinction between them? This question leads us to examine the physical appearance of hemp and marijuana plants. How to identify the hemp plant and differentiate it from the marijuana plant? Does hemp have flowering buds? Industrial hemp generally refers to cannabis plants with tall, fibrous stalks, very few flowering buds and skinny leaves concentrated near the top of the plant. On the other hand, marijuana Cannabis strains are short and bushy, consisting of broad leaves and tight buds. Thus, industrial hemp and medical marijuana appear to take on distinctively different physical forms and can often be clearly distinguished from each other. Hemp is generally grown in large industrial plots and densely packed with spacing as small as 4 inches between adjacent crops. Its growth cycle is up to 108-120 days. On the contrary, marijuana requires high maintenance and a temperature controlled environment. As such, marijuana tends to be grown in warm and carefully controlled environments with a spacing of 4-6 feet between each plant and a shorter growth cycle of 45-90 days. It is absolutely critical that hemp and marijuana plants remain separated during their growth cycles because the marijuana crop can lose its high THC psychoactive properties if exposed to hemp pollen. Cannabis plants consist of a wide variety of cannabinoid compounds, two of the most important of which are THC and CBD. Both cannabinoids have been shown to provide numerous health benefits for the human body, but CBD lacks the psychoactive properties of THC and is hence becoming increasingly popular. While marijuana is bred with the sole purpose of maximizing its THC content, industrial hemp always has trace amounts of THC and naturally occurring high CBD content. Generally speaking, hemp is classified as a Cannabis strain with a low THC content of 0.3% or less (by dry weight), whereas marijuana is abundant in THC averaging 5-20% with premium marijuana containing up to 25-30% THC (by dry weight). Finally, where THC is involved, legality is a considerable overhead. In the following section, we deep dive into the legal matters associated with hemp and marijuana. Is hemp illegal? What is the current legal situation when it comes to marijuana? Hemp and marijuana are legally defined by the concentration of THC in the plant. When it comes to the United States, industrial hemp has finally been legalized on a national level through the Hemp Farming Act of 2018 (https://en.wikipedia.org/wiki/Hemp_Farming_Act_of_2018) which has been included in the 2018 Farm Bill. The 2018 Farm Bill was passed on December 20, 2018, thus granting hemp the status of an ordinary agricultural commodity. However, hemp is legally considered to be a Cannabis strain with THC levels under 0.3% in North America (2018 Farm Bill), while in the EU that limit is 0.2%. Since hemp contains very little psychoactive THC it is also legal in most parts of the world, whereas the consequences are minor in regions where it remains illegal. On the other hand, marijuana is predominantly illegal worldwide due to its high THC content and the associated euphoric effect. Some countries worldwide and some states in the United States have recently legalized marijuana owing to its large economic and medicinal potential. While the changing regulatory landscape will likely bring further legalization of high THC strains, marijuana remains mostly illegal at present. Cannabis has been highly resilient, thriving in various ecological and legal environments. Human innovation has allowed its breeding and cultivation to bring forth all of its genetics capabilities in remarkable ways. Furthermore, it must be noted that the physical distinction between hemp and marijuana is rapidly fading and becoming obscure due to the human ability to breed and cultivate an increasing number of Cannabis varieties. Farmers are even able to grow high-resin cannabis (marijuana) with a low THC (<0.3% by dry weight) and a high CBD content (>10% by dry weight) nowadays. This appears contradictory since marijuana is usually associated with high THC content. However, with the advent of the CBD industry and the legal matters defined by the latest Farm Bill, farmers have found innovative ways to successfully grow and process CBD-rich plants in order to extract CBD oil for medicinal and personal use. Cannabidiol 101: Ultimate Guide for Beginners 2019 > Hemp vs marijuana: what is the difference?